There is so much more to an enjoyable meal than good food. Many people frequent a particular restaurant and it is not solely because they love the cuisine – the ambience of the place also draws them back. What is the ambience of a good restaurant made up of? Well, surroundings, lighting, music and incense all contribute to it. So, let’s have a look at these elements. 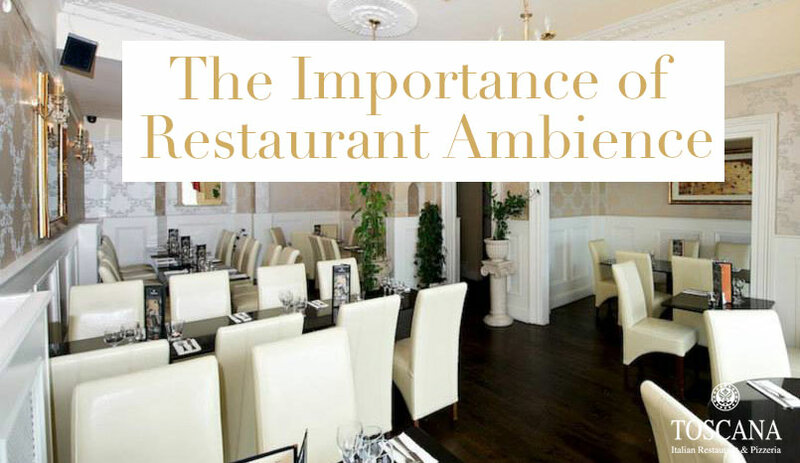 A good restaurant will be tastefully decorated to suit the kind of food that is on offer. 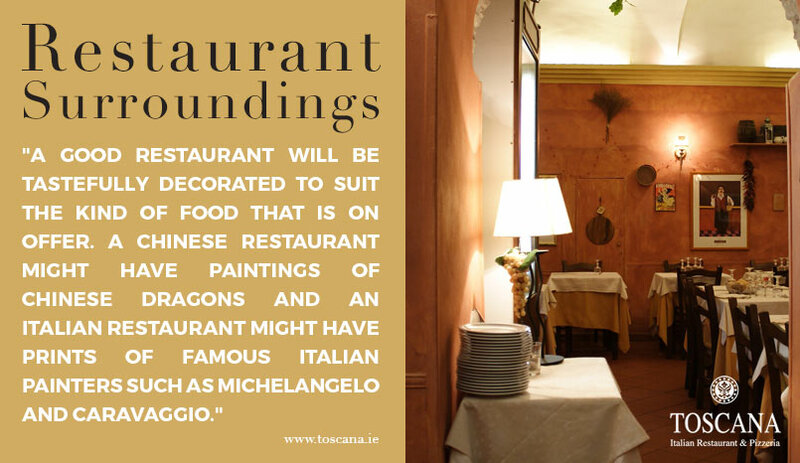 A Chinese restaurant might have paintings of Chinese dragons and an Italian restaurant might have prints of famous Italian painters such as Michelangelo and Caravaggio. Mirrors are also part of the surroundings of many restaurants. People like to get dressed up for a meal and the mirrors add to the pleasure of looking your best. Of course, people don’t go to restaurants to look at themselves, it is just part of the general ambience of pleasure and relaxation. Most people don’t take much notice of their surroundings because they are absorbed in conversation – they are not there to study paintings, but we take in a lot more than we think. These things on the periphery of our consciousness play a major role in our decision to return to a restaurant. Again, it varies according to the theme of the restaurant. Chinese restaurants tend to have subdued lighting whereas Italian restaurants tend to be brighter. There may be cultural reasons for this or it may be simply because of the nature of the food. Italian food is very colourful and bright light allows us to appreciate this. Also, it recreates that Mediterranean sunshine. Most restaurants will play some kind of music. It adds pleasure to the whole dining experience. Music is a way to keep people entertained while they wait for their food. Sometimes it is just background to conversation: this kind of music often reflects the theme of the restaurant e.g. an Indian restaurant might play generic sitar music. Other places, such as American diner style restaurants, will play popular music which is more entertaining than background music. Many restaurants burn incense for that extra bit of olfactory pleasure. The smell of incense and food makes for a pleasant mixture. The sense of smell is the oldest sense humans possess and stimulating it with incense is a way to make a meal truly memorable. 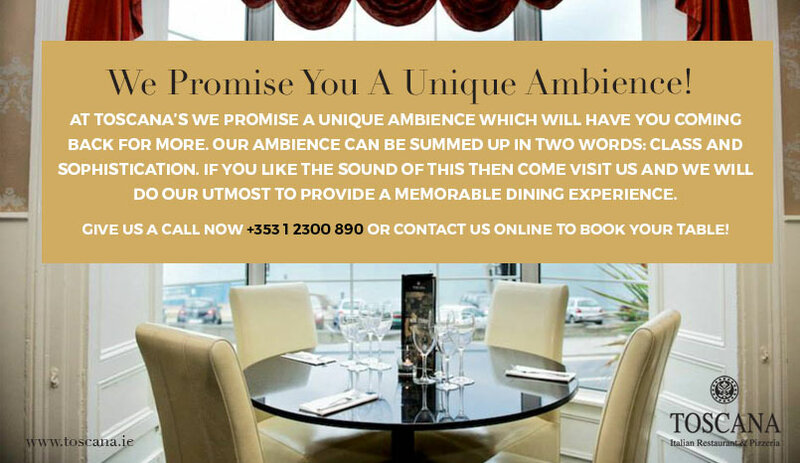 We Promise You A Unique Ambience! A meal should be a pleasurable, sensual experience and these four elements contribute to making it so. The joy of good food and good company is enhanced by the ambience, so much so that we are drawn back to the holistic experience of eating in a particular place. Every restaurant has its own unique ambience which attracts some people more than others. Better to have a unique ambience than none at all. At Toscana’s we promise a unique ambience which will have you coming back for more. Our ambience can be summed up in two words: class and sophistication. If you like the sound of this then come visit us and we will do our utmost to provide a memorable dining experience. Give us a call now +353 1 2300 890 or contact us online to book your table!